Video Above: My 360 degree introduction video from the Atacama Desert, Chile. I am very excited and grateful to be a 2017 National Oceanic and Atmospheric Administration (NOAA) Teacher at Sea (TAS). The TAS program has existed since 1990 and their mission is to provide real world research experience for kindergarten through college-level teachers. The application process opens in the fall and teachers are notified in the spring if they are selected. This year there are 29 teachers who have either already sailed or, like me, are about to embark. Check out the TAS FAQ’s page to learn more about the program: NOAA TAS Frequently Asked Questions. Video Above: Google Earth view of where I will be starting my Teacher at Sea cruise. Kodiak, Alaska is a small fishing village on Kodiak Island. There are two ways to get to the island – by air or by sea. I will be flying to Kodiak from Anchorage and will board the NOAA vessel Oscar Dyson. This is my 3rd time visiting Alaska but my first time at sea. I got engaged in 2014 on top of the Harding Icefield in Kanai Fjords National Park. Having just arrived home from one of the driest deserts in the world (Atacama, Chile) I am reminded that the desert is my home. I have lived in Phoenix, Arizona, far away from the sea, for the past 25 years. I love the warm sunny heat of the desert but not when it gets over 110 degrees. So I am looking forward to a change in weather and scenery. Alaska is beautiful in the summer with really long days of sunlight. I am hoping to see a whole new view of this rugged wild state during my three seeks at sea. I just hope I don’t get sea sick! To be able to describe how and why we research pollock. To be able to describe life at sea on a NOAA ship and the careers associated with the NOAA Corps. To be able to describe navigation techniques and how they have changed over time. My ultimate goal is be able to bring this information back to the classroom. I have always been fascinated with navigation. Reading maps is an important part of being a geologist and I wonder how similar or different it will be at sea. As a geology student I leaned how to map the contact between two rocks. So I am really curious to learn how you chase fish in the sea. Please feel free to leave a comment below if you have any questions or want me to investigate something while at sea. When you apply to the TAS program they ask you which type of research cruise (hydrographic, oceanographic, or fisheries) you would prefer. I checked both hydrographic or oceanographic because of my geology background. I teach about weather, climate change, and have always been curious about how we map the ocean. So I am a little nervous about being on a fisheries cruise for 3 weeks. But I am also excited about the opportunity to learn and explore something completely outside my norm. My family finds this amusing because as a kid all I did was fish. Me fishing around 9 years old. 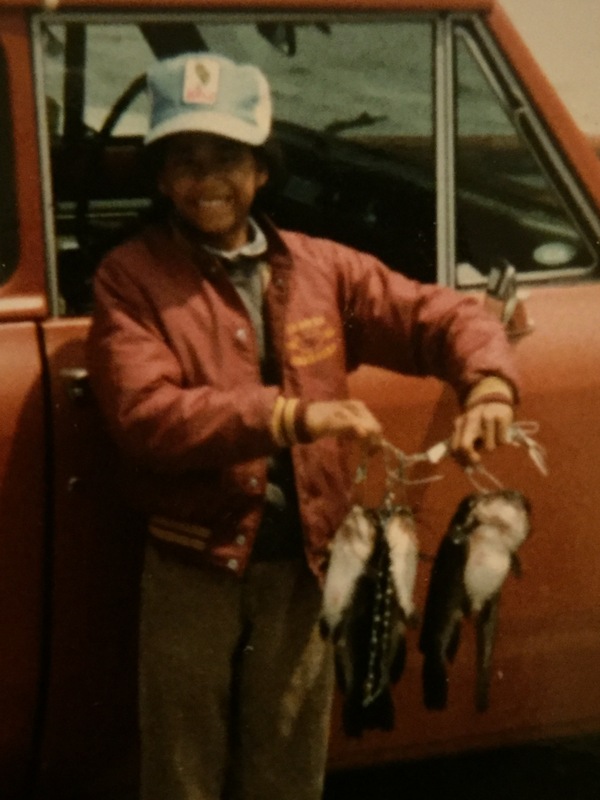 Here is a photo of me fishing at age 9. During the summer time, while living in New Hampshire, I use to fish everyday. But around the age of 12 that changed. I became less interested in the biological world and more into the physical world (geology, physics, chemistry, etc.). I stopped fishing and haven’t picked up a pole in over 35 years. Even when I was into fishing as a kid, I still didn’t like touching them. Now I will be spending 3 weeks studying Alaska pollock (walleye pollock) off the coast of Alaska. As a result of this experience, I wonder if the girl in this photo will rise like a phoenix and fall back in love with fishing. Hmm – at the moment I’m thinking it’s a 50-50 chance! What do you think? Leave me a message in the comments below. This entry was posted in 2017, NOAA Teacher at Sea, Sian Proctor and tagged Alaska, fisheries, NOAA Ship Oscar Dyson, Pollock, video, Weather. Bookmark the permalink. Sian this is so exciting!!! I’m absolutely going to be following your adventures!! So fascinating!! Love it!! This is so fascinating!! I’m intrigued by this study and wondering what the importance of this sound data is? What can it reveal for us? I look forward to continuing to follow this wonderful and educational experience! Thank you for blogging all of it! Hi Lisa, the sound is the best way to identify where the fish are and to some extend, what species. I’m amazed at how much you can learn from acoustics. HI, Sian!!! So enjoying your adventures and such great information. Thanks for sharing. I live vicariously through you! I am not sure if you are going to turn back into fisherwoman…but I know you like to EAT fish for sure! Hi Donna, It is great to hear from you. You are not going to believe my next post when I am elbow deep into fish. We should go fishing sometime when I get back. LOL I can’t wait to meet Indi!